What is Included in a Lindsay Drilling Pump System? We believe that quality and economy go hand-in-hand. Our pump systems are designed to be as trouble-free for as long as possible. All materials and equipment we install are guaranteed through a manufacturer’s warranty. In addition, Lindsay Drilling’s service department is highly trained and experienced in all types of pumps and well services. The pump service rigs use the latest in hydraulic equipment. These units are outfitted with a full stock of parts and equipment to maintain efficient and economical service. Modern equipment in the hands of experienced servicemen allows us to solve all your water problems quickly and at a minimum expense. The well cap provides a watertight seal when the inner gasket compresses to the outside diameter of the casing. The top of the well cap removes easily to access the well for servicing. The first 25 feet of well casing must be steel per state standards. The remaining casing that is used is determined by the formation of the ground whether it be PVC plastic or steel. The pressure tank is a storage vessel containing air and water that provides storage of water under pressure for delivery between pump cycles; allows for reserve capacity for periods of peak demand; protects and extends the life of the pump by reducing the number of on/off cycles; and helps reduce overall system maintenance. The pressure gauge indicates how much air pressure is found in the pressure tank. Pitless adapters provide wells with a sanitary – and frost-proof – seal between the well casing and the water line running to the well system owner’s house. 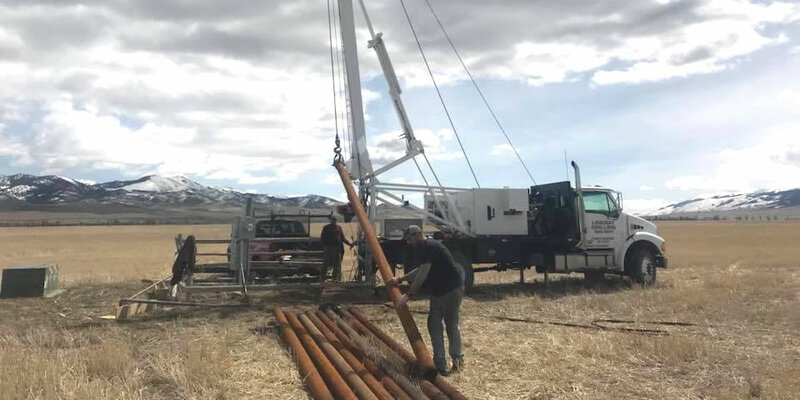 After a frost line is determined for the area where the well is being installed, the adapter is connected to the well casing below the frost line. Water from the well is then diverted horizontally at the adapter to prevent it from freezing. The check valve is located at the top of the pump to hold water in the tank and prevent backflow through the pump. All water pumped from the well is delivered to the service outlet, no water is recirculated. Submersible pumps have a reduced power consumption which results in lower operating expenses. As capacity and pumping depth requirements increase, submersible pump installations and performance advantages increase. Multi-staging of the centrifugal impellers and diffusers permits matching the pump to the well capacity and the required service conditions. Development of corrosion/abrasion resistant materials and improved manufacturing methods assure the pump has a long life.